It's easy enough to pick a gun belt for range days - you just grab one that will hold up for a bit and go - but picking a concealed carry belt is a whole other matter. Just finding anything labeled "gun belt" just isn't quite going to do it, and yes that means you probably should stay away from the cheap ones you find at the local mega "mart" store - you know, the one that has the people of it. If you're going to carry every day, you should select a quality gun belt to do so with. What, then, to look for in a CCW belt? 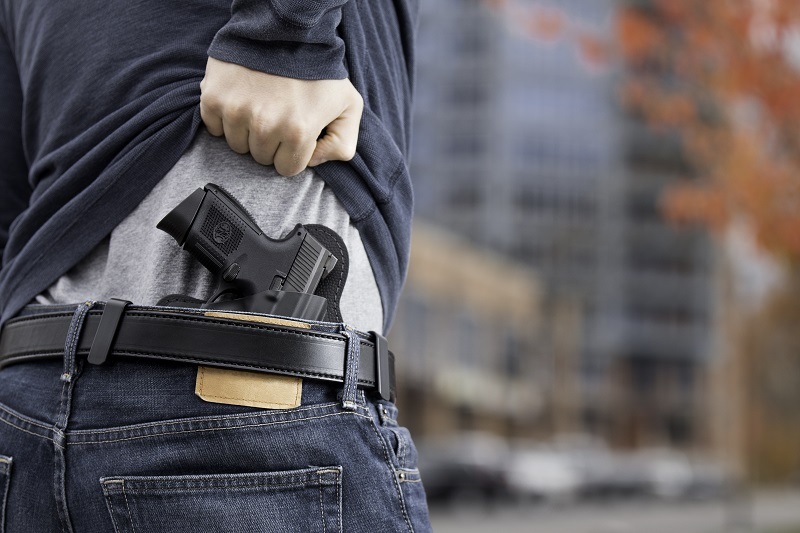 The first order of business, of course, is that it has to hold the weight of a pistol, holster, your pants, and anything else you're planning to hang from the belt - such as mag carriers, multi-tool, cell phone, etc. The typical leather belt, like one might find in most stores, is not really going to be adequate as a CCW belt. The garden variety fashion belt is not built strong enough to handle the additional weight of a pistol. Granted, the typical pistol is not very heavy (usually between two to three pounds, loaded) which isn't a lot. However, the weight is not spread out across the entire belt, as if one had added two or three pounds to the weight of their trousers, but rather in one spot- where the pistol is holstered. This leads to additional stress on the area bearing the weight of the gun. What that extra strain produces is a stretching and warping of the material the belt is made from. 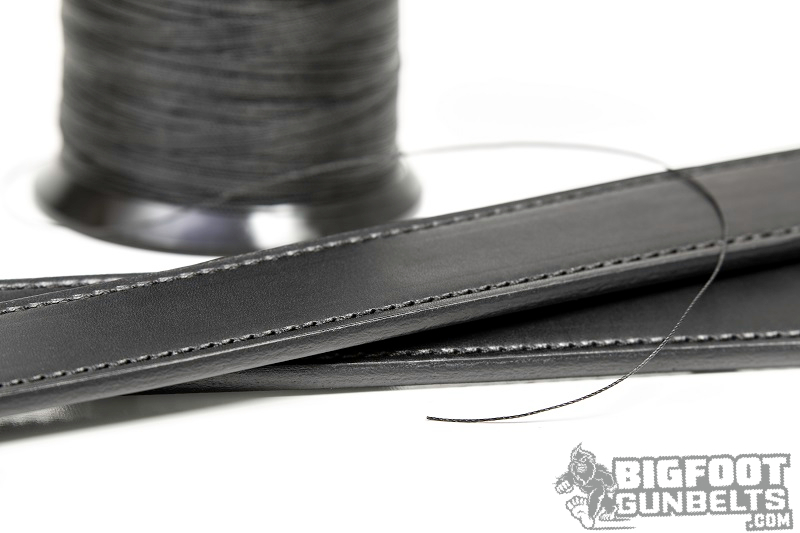 Low-grade leather, or a leather belt that's too thin, will start to crease, stretch and warp and the result will be that the belt starts to sag where the pistol is situated on the belt - sometimes called "gun sag." Gun sag can reveal a pistol to passersby, or possibly lead to a pistol dropping in some instances. Therefore, investing in a good gun belt is an investment in a secure carry. For nylon, web or some other non-leather carry belt, you should pick the highest-rated material available, if given a load rating. If not, look for a denier (measure of thread density over a given distance) rating of 600D or higher, if available. Additionally, to not call attention to the fact that you're a grown person wearing a non-leather belt, pick a flat color - black or brown are always good choices. A leather gun belt is much like any other leather belt for the most part. However, they are made of slightly heavier hide; the typical leather belt is made from 12-ounce or lighter leather; many gun belts are made from 14-ounce leather and heavier. Double-layer belts will be stronger than single-layer belts, provided good construction; note the stitching. Do any strands look frayed? Is the stitching loose? If either is the case, it isn't likely to hold up. Stitching looks uniform and tight? That's a solid belt. Additionally, some belts can be had with an internal stiffener. This provides a "spine" to the belt, so it won't crease, bend, break or lose its shape. The stiffener can vary; ABS, Kydex and other materials are common. Some offer spring steel. Nylon and leather belts alike can be had with stiffeners, so that choice is up to the wearer. Pay attention to the width. The typical fashion belt falls between 1 inch and 1 ½-inches in width. Most belt loops will not accommodate a belt wider than 1 ¾ inches. A 2-inch rigger belt...probably won't work. Also look for adjustability. 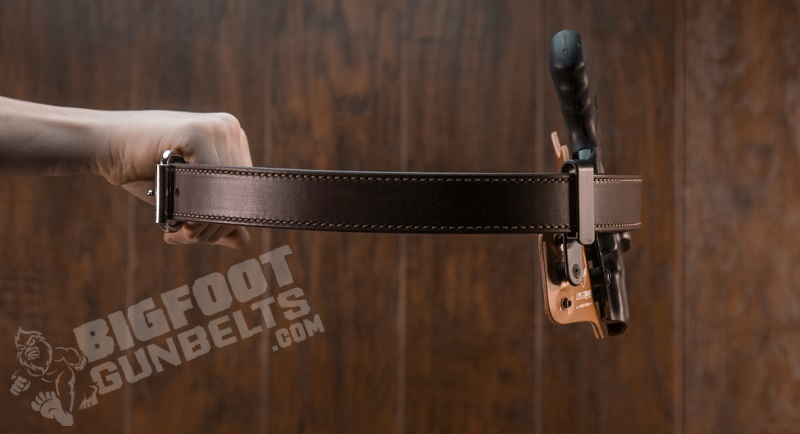 Leather belts usually feature five or seven belt holes; the latter allows for more adjustment than the latter, which can be important if one alternates between IWB and OWB carry. Some belts allow much more adjustment; a number of "ratchet" belts are hitting the market offering a ratcheting buckle that can allow a large amount of adjustment. That's highly useful if one intends to lose weight in the near future - or just after Thanksgiving dinner. Since a concealed carry belt is first and foremost a belt, one may also want to pay mind to their wardrobe. Yes, fashion is silly, but some of us do have office jobs to go to, some of which have dress codes. That would more or less dictate leather be the choice for the carrier who must adhere to business casual or professional dress - and many fine leather gun belts are available and black just goes with everything. 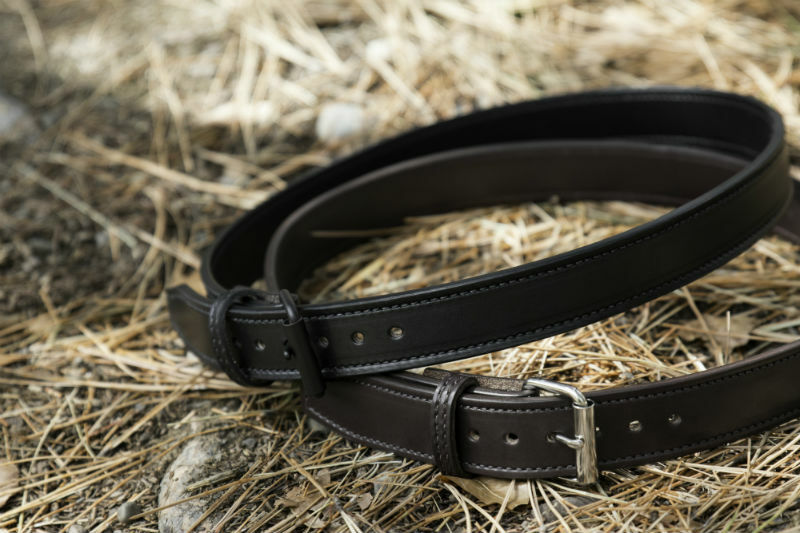 If ordering online, one might consider finding a gun belt maker who offers a trial period or calling customer service before ordering and inquiring about the returns policy. This belt has to be comfortable enough to wear all day, every day. If it isn't and there's no way to return it or get a refund...you end up with a useless strip of leather and the purchase price out the window. So there you have how to pick a CCW belt. It has to be strong enough to do the job, built to last, and should look good doing it.